Title: 04/30/1986 - Labeling requirements for containers of polyvinyl chloride. This is in response to your letter of February 26, regarding the hazard of polyvinyl chloride. We apologize for the delay in responding to your inquiry. We have contacted members of the editorial review board of the Registry of Toxic Effects of Chemical Substances (RTECS) published by the National Institute for Occupational Safety and Health (NIOSH) in regard to your suggestion that RTECS may contain an error where it includes in the data record some carcinogenic determinations for polyvinyl chloride that are ascribed to the International Agency for Research on Cancer (IARC). We have been informed that entries, "Carcinogenic Determination: Animal Positive" and "Carcinogenic Determination: Human Indefinite", were not made in error. Rather, they are the interpretation by the contractor used by NIOSH of statements made in IARC 19, 1979. 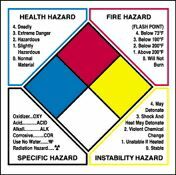 The vinyl chloride standard controls the labeling that polyvinyl chloride must bear with respect to information on carcinogenicity. Provision 29 CFR 1910.1017 (1)(4) requires that containers of polyvinyl chloride shall be labeled as containing vinyl chloride. Moreover, the provision requires that the label state that polyvinyl chloride is a cancer-suspect agent. Such labeling, however, is not required for "fabricated products." A "fabricated product" is described at 29 CFR 1910.1017 (b)(6) as "...a product made wholly or partly from polyvinyl chloride, and which does not require further processing at temperatures, and for times, sufficient to cause mass melting of the polyvinyl chloride resulting in the release of vinyl chloride." Consequently, polyvinyl chloride resin that has not yet been processed into film, or sheeting, or has not yet undergone final molding or extrusion, must be labeled in accordance with 29 CFR 1910.1017 (1)(4); whereas the film, sheeting, final molded products, and final extruded products do not. Whenever labeling according to 29 CFR 1910.1017 (1)(4) applies for a polyvinyl chloride product, then the provisions of the Hazard Communication Standard, 29 CFR 1910.1200, also apply, subject to the limits on scope and applicability found in the standard. On behalf of the Vinyl Institute, a division of The Society of the Plastics Industry, Inc., we request an official interpretation of OSHA's Hazard Communication Standard, 29 C.F.R. 1910.1200. (*). Our concern focuses upon the status of polyvinyl chloride (PVC) as a carcinogen or potential carcinogen under the Standard. PVC is not a carcinogen. However, confusion may be created due to the characterization of existing scientific evidence in a document referenced in the Standard. The Standard notes that the Registry of Toxic Effects, published by the National Institute for Occupational Safety and Health (NIOSH), indicates whether a chemical has been found to be a carcinogen or potential carcinogen by NTP or IARC. Polyvinyl chloride, or PVC, is produced from vinyl chloride monomer through a chemical reaction called polymerization. While vinyl chloride monomer is a regulated hazardous material, it is transformed through polymerization into a white granular powder, PVC, which is nonhazardous. Polymerization is a "one way reaction"; thus, PVC powder does not revert back to vinyl chloride. PVC is widely used in a large number of commercial products, including water pipe, floor and wall coverings, vinyl siding, upholstery, records and wrapping films. However, IARC Volume 19, does not report a conclusion that PVC is a carcinogen or potential carcinogen. The referenced IARC study is one of a series which focused on evidence generated from various subcutaneous implementation tests. These tests produced local tumors when particles of a correct size were used. Such results are not accepted as sufficient evidence of carcinogenicity by either the scientific community or various Federal agencies. 29 C.F.R. 1910.44 (b)(ii). In addition, it is important to note that IARC's summary of substances classified as Group I or Group II does not include PVC, accordingly, we believe that PVC is not covered by the Standard. See OSHA Instruction CPL 2-2.38, p. C-2. Rather, there is an error in the NIOSH Registry in characterizing the IARC studies. We would be most appreciative if you could confirm, at your earliest convenience, that polyvinyl chloride (PVC) is not a carcinogen or potential carcinogen under the Hazard Communication Standard. If this discussion raises any question, or if we can provide further information, please do not hesitate to contact us at any time. *SPI, the major national trade association of the plastics industry, is a corporation organized under the Not-for-Profit Corporation Law of the State of New York. Its 1,600 member companies and individuals and 49 operating units include those who supply raw materials; and engineer or construct molds or similar accessory equipment for the plastics industry. The majority of SPI members are the processors and converters of plastic resins into end products which represent 75% of the dollar volume sale of plastics in this country. Members of the Vinyl Institute include Air Products & Chemicals, The BFGoodrich Chemical Group, Borden Chemical, Certain-Teed, Dow Chemical U.S.A., Occidental Chemical, PPG Industries, Shell Chemical Co., Tenneco Polymers, and VISTA Chemical. Members of the Vinyl Institute account for approximately 82% of the domestic production of vinyl chloride and 63% of the domestic production of polyvinyl chloride.